Vehicle remarketing business Aston Barclay has chosen B38 Group to provide a full range of property support services at its new 70,000sq ft vehicle auction mega centre near Wakefield, Yorkshire. 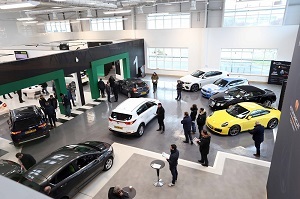 Opened in January 2019, the 18-acre Normanton site features two glass-fronted auction halls and has storage for 2,500 vehicles, as well as having leisure facilities, a restaurant and meeting rooms. It is believed to be the most modern and technologically advanced auction facility in Europe. Following a competitive tender, Wakefield-based B38 Group was awarded a three-year contract to provide a total facilities management (TFM) service covering both ‘hard’ technical building services as well as cleaning and other ‘soft’ services. “The opening of our Wakefield mega centre is part of our strategy of combining digital technology with a first class physical auction experience in order to create large, regional auction hubs,” explained Martin Potter, Managing Director of Aston Barclay. “With banks of video screens and a high spec internal finish, the mega centre has been designed to provide a dynamic market environment and it’s vital that customers have the best possible experience when they visit.